Here are nine solos for plectrum guitar written with the tradition of the Celtic ballad and Scottish Aire. Many of the solos call for a 7 string guitar but can certainly be played on a 6 string. I have shown alternate notes for the low 7 string pedal tones in the tablature. The solos give the guitarist an opportunity to play concert settings with a maximum of expression. I have recorded all of the solos and they are available as a free internet download. This book is a sequel to my solo collection entitled- "Guitar Meditations" (MB22029) . 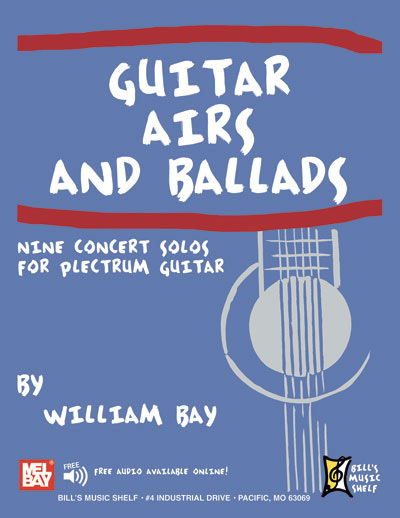 I have authored both solo collections to address the need for serious compositions for the plectrum guitarist wanting to play in concert or recital. The music in each collection draws from a wide variety of influences and utilizes many contemporary harmonic concepts. I hope you enjoy performing and listening to these solos.